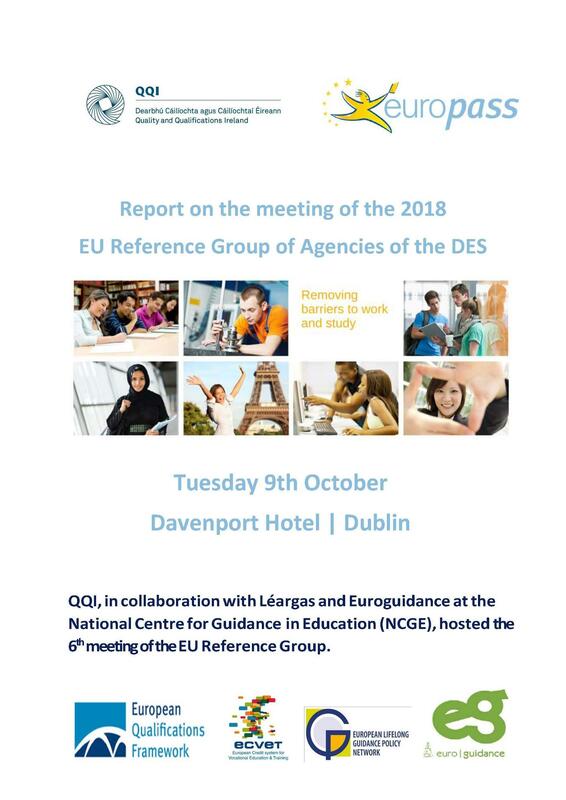 Euroguidance Ireland presented an overview of Euroguidance in Ireland and Europe at the Sixth Meeting of the Irish Reference Group for EU Initiatives in Education and Skills in Dublin on 9 October 2018. It was organised by the Quality Qualifications Ireland agency which includes Europass and NARIC Ireland. This meeting’s focus was on current European initiatives; to share emerging findings from new projects and discuss potential developments affecting learner mobility. The presentations included contributions from Europass, Euroguidance, the European Qualifications Framework (EQF), Erasmus+ and other European initiatives. Euroguidance Ireland described the work of NGCE/Euroguidance with the European Lifelong Guidance Policy Network (ELGPN) and Cedefop, the guidance service offered to Irish students in European Schools, the provision of a Mobility Guidance on-line course for guidance counsellors who support students who wish to study abroad and Euro-Quest, a programme currently being piloted in post-primary for students interested in studying abroad. All of these promote educational mobility across Europe.